This recipe was inspired by a great meal I had at Bar Pintxo , a Spanish tapas restaurant in Santa Monica. Chef David makes an amazing dish that I order every time we go there to eat. He uses prawns and of course cooks them perfectly. I have no idea what his recipe is but this is a way to sample some of these flavors. Maybe some time he’ll let me in on some of his secrets or you’ll have an opportunity to sample his dish yourself. 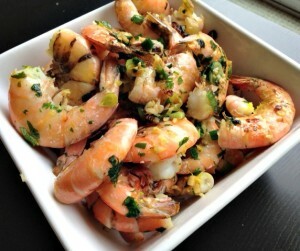 To keep this fast and easy to cook all you’ll need to do is wash and dry your shrimp. You can peel it as you eat it. If you want to take a little more prep time you can peel the shrimp but leave the tails on. 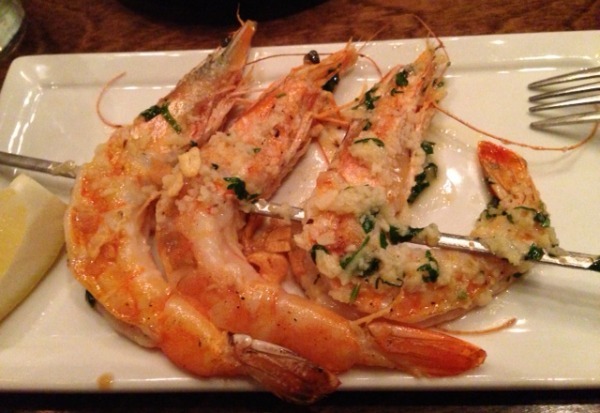 If you’re serving a really fancy meal and you can get your hands on prawns you can serve them like they do at Bar Pintxo . Copyright © 2010 Diane Eblin - The W.H.O.L.E. Gang. All rights reserved.